Dr. Mangold is a 31-year resident of Tucson, having come from San Antonio, TX, where he was on the faculty of the University of Texas Medical School. For the first 15 years in Tucson, he was in solo practice of Plastic and Reconstructive Surgery. He then served for two years as the President and CEO of Mutual Insurance Company of Arizona (MICA), the physician-owned professional liability company that provides the malpractice insurance for most of Arizona's physicians. Since 1997 he has been the Contractor Medical Director for Medicare Part B for Noridian Administrative Services; he now fills that role in 10 States: Alaska, Arizona, Idaho, Montana, North & South Dakota, Oregon, Utah, Washington and Wyoming. He was the National Medical Director for the Medicare drug Competitive Acquisition Program (CAP). He is the AMA Alternate to the Relative Value Update Committee (RUC) and has been an Arizona Delegate to the AMA House of Delegates since 1995. Dr. Mangold's background includes having practiced small town Family Practice with his father in his hometown of Lockney, Texas. He is also a licensed attorney, having graduated form the University of Texas Law School. 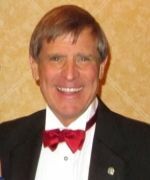 He is Past-President of the Arizona Medical Association and has been heavily involved with the affairs of organized medicine, including national positions with the American Medical Association (AMA), since 1969. He has served the Tucson and Arizona communities in a number of positions, recently completing nine years as a member of the Board of Arizona Opera (serving from 2004-2005 as the President for Tucson and Southern Arizona). He is a member of the Arizona Judicial Council (AJC), the body responsible for advising the Arizona Supreme Court on all rules governing Arizona's court system. He served a five-year term as a member of the Arizona Commission on Appellate Court Appointments, the group which provides nominations to the governor for Appeals Court and Supreme Court judicial appointments. He is an avid cyclist and is currently in the midst of a staged solo bicycle crossing of the US, with his wife driving as support crew. They also enjoy hiking and backpacking throughout Arizona.